Shop Dunlop DBSBN Super Bright Nickel Wound 5 String Bass Strings from AMS and enjoy Fast & Free Shipping. 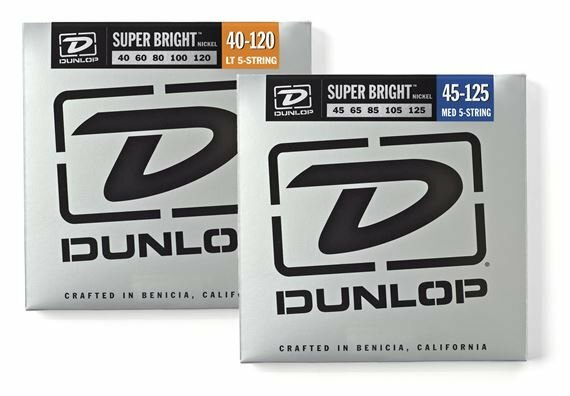 Dunlop Super Bright 5-string bass strings are designed for bass players who want to stand out in the mix with a crisp top end without sacrificing any fundamental. Carefully designed and tested by a team of bass players, Super Bright Bass Strings sing with clear, defined highs that are supported by a fat, balanced bottom that keeps your sound full and round. Lighter tension provides a superior response to playing nuances, and the silky smooth feel of each string provides superior playing comfort. With extra-long life and exceptional string to string balance, Dunlop Super Bright Bass Strings allow the natural voice of your bass to come through.